The fleshy-walled follicle splits to release many plumose seeds. Native to Argentina, but widely naturalised and of some concern in a number of regions with Mediterranean-type climates. Not likely, however, to become a problem in East Africa. Rapini, A. (2010). Revisitando as Asclepiadoideae (Apocynaceae) da Cadeia do Espiniaço Boletim de Botânica da Universidade de São Paulo 28: 97-123. Orchard, A.E. (ed.) (1996). 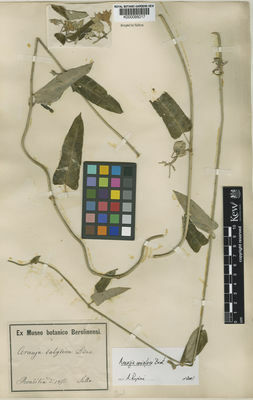 Flora of Australia 28: 1-335. Australian Government Publishing Service, Canberra.